Dear N Scale Modelers: Micro Trains has just sent us the images of the new Toronto Hamilton & Buffalo 40ft Single Door Boxcars, they did a great job. These cars were originally used for service In Canada and the United States, and have never been done in N Scale. The cars should be here next week. There are only a few sets left. Note the rust and the General weathering to match the other 40ft cars we have done already with Micro Trains in CPR and CNR. Enjoy. This car has been done for HO Scale customers - Puce Creek sponsored a special run by Bowser of this one car. 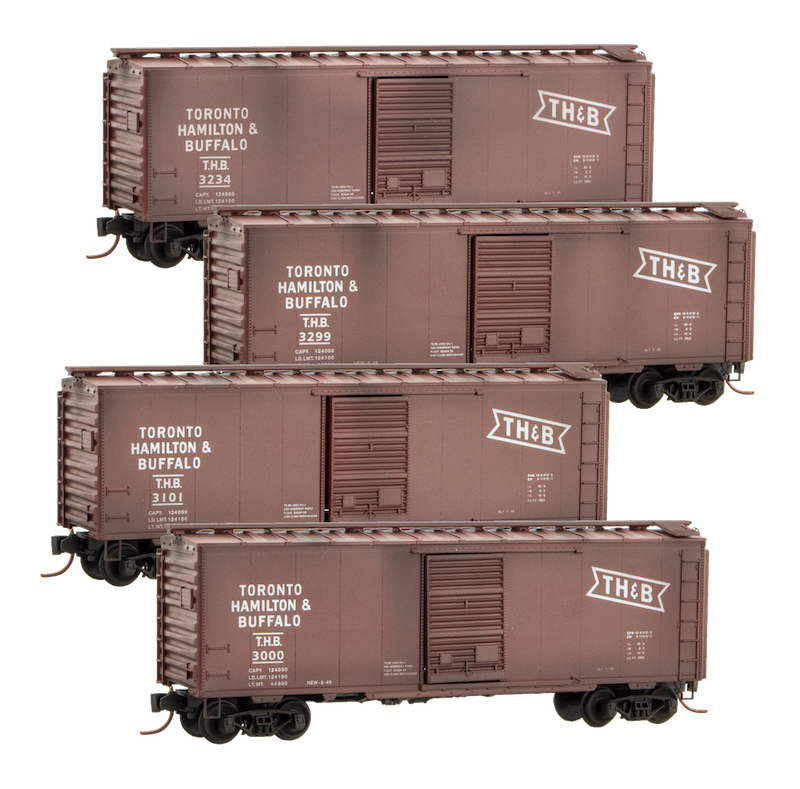 The Toronto, Hamilton & Buffalo box car has never been done in N Scale. It is totally unique and should have been done long ago. The Toronto, Hamilton & Buffalo Railway (TH&B) existed from 1892 through 1987 as a separate railway serving the Hamilton, Ontario area. It joined the lines of its corporate parents, the Canadian Pacific Railway and the New York Central system. It was established largely as an alternate route for the businesses in the Hamilton area to ship their products to Canadian customers in Toronto, Montreal, and the west and to American customers via the New York Central and its subsidiaries. The TH&B was jointly owned after July 1895 by the CPR and NYC (and its successor, Penn Central) until 1977, when CP Rail bought the remaining shares and became full owner of the railway. Thereafter, TH&B was integrated into the operations of its parent in 1987, losing its distinct identity as a separate railway. Railroad boxcars are perhaps not only the best-recognized pieces of equipment ever put into service but are also one of the most identifiable symbols of the industry itself. It has a history tracing back to the earliest years when railroads realized that some freight and lading needed at least a little protection from the outside elements and Mother Nature. They have been around since the 1830s, and the height of 40-foot boxcars was in 1942, when the overall fleet peaked at 754,322. What made boxcars great, at least in the eyes of the railroads, was their ability to haul about anything! Railroads thrive on redundancy to maximize efficiency which was the reason they loved the boxcar so much. For many years the boxcar carried everything from automobiles and paper, to car parts and fresh produce; literally almost anything that would practically fit into the car’s empty, open spaces. The car's development continued to improve over the years – such as switching from basic wood construction with steel outside-bracing to all-steel designs (which were much stronger and capable of hauling heavier loads), even within the same size specifications; 40 feet, a standard size employed by the American Association of Railroads (AAR) although the initial standardization methods came about from the United States Railroad Association during WWI. The first standard, all-steel design entered service in 1932 thanks to the recommendations of the American Railway Association, predecessor to the present-day AAR. While the 40-footer was a standard design it did come in different setups depending on the type of freight being transported. Double-doors became practical for large/wide loads, end-doors useful for very large lading such as automobiles, and interior tie-down equipment was helpful in keeping sensitive products from being damaged in-transit. Technology for new boxcars with upgraded suspension systems further improved the ride-quality and reduced the chance of damaging freight. The 50-foot boxcar made its first appearance in the 1930s and steadily grew in popularity over the years, which further improved redundancies by allowing for even more space within a given car. Today, the 50-footer remains the common boxcar size. Over time railroads realized, largely through complaints by shippers, that more specialized cars were needed to haul unique types of freight. This issue led to the development of the well car, autorack, refrigerator car, and several other specific designs. Boxcars, however, still have their place in today's industry especially in carrying bulky items such as autoparts. 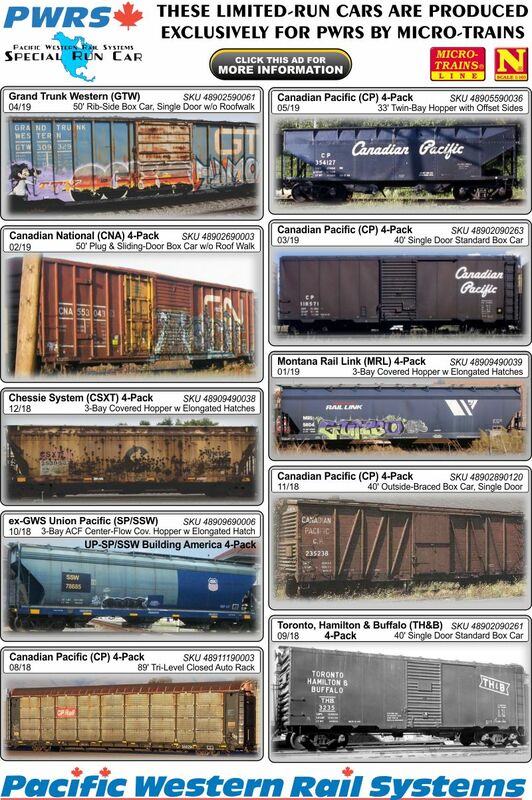 Of the freight cars running today in North America, covered hoppers rule the day with almost 400,000. Tank cars make up about 300,000 (and are growing fast due to the crude oil boom). Gons come in third at about 200,000. Of the 90,000 or so boxcars, fewer than 18 40-foot boxcars are still around, and only one has turned a wheel lately, far out of sight, and out of mind, the last of its kind. Accurate painting and printing with correct road numbers for each paint scheme.